Alice & Co. face south and the shining sun. This year Alice’s Adventures in Wonderland, the beloved story for children of all ages, marks its 150th anniversary since Macmillan & Co. first published the book in England. Among its initial, avid readers were Queen Victoria and a young Oscar Wilde. Thanks to the Walt Disney animated motion picture based on the book, in America it is known as Alice in Wonderland. The tale of a young girl and what she found down the rabbit hole is celebrated in gleaming bronze in New York’s Central Park, the world’s greatest urban oasis. The White Rabbit, umbrella and watch in his hands. The White Rabbit, always late for a very important date, checks his watch. Located at the northern end of Conservatory Water, the nine-foot-plus tall bronze was a gift to Central Park from George Delacorte (1893-1991), founder of Dell Publishing Company. Alice, perched on a mushroom just as the hookah-smoking Caterpillar is in the story, gazes at her cat, Dinah. They are flanked by the White Rabbit, checking his pocket watch; the ever-smiling Cheshire Cat; the timid Dormouse, nibbling on a treat; and the zany Mad Hatter. Dinah, Alice’s cat, climbs to her lap. Mr. Delacorte commissioned the Spanish-born, French-trained sculptor Jose de Creeft (1900-1982) to create a tribute to his first wife Margarita. The official name of the artwork is the Margarita Delacorte Memorial. After her death Mr. Delacorte searched for a way to honor his beloved wife. He often sat in Central Park, watching the children run about, climbing on the outcroppings of Manhattan schist seen throughout the Park. This gave him the idea of a work of art that was designed to be interactive. The subject choice was easy. Mrs. Delacorte had been fond of the stories by Lewis Carroll; her favorite was The Jabberwocky. Mr. Delacorte remembered his wife reading Alice’s Adventures in Wonderland to their six children. Alice’s features are those of the sculptor’s daughter. Señor Creeft worked closely with architect Hideo Sasaki and designer Fernando Texidor, who are responsible for the Chelmsford gray granite esplanade where Alice holds court. Mr. Delacorte selected the location next to Conservatory Water because he believed it to be the best in the Park. The facial features of Alice are those of Señor Creeft’s daughter, Donna, and those of the Mad Hatter are a caricature of George Delacorte. Smile, as the Cheshire Cat always does. Dedicated by Parks Commissioner Robert Moses on the 7th of May 1959, this gift to New York City children was cast by the Modern Art Foundry of Long Island City in New York’s borough of Queens. Señor Creeft patterned the characters on the original illustrations of John Tenniel that were used when the book was first published. The Dormouse nibbles a treat. The sculpture is one of the most popular in the Park. Unlike most sculptures, children are encouraged to climb, touch and crawl over, between and beneath Alice and her friends, exploring the many textures and hiding spaces. Through the years thousands of hands, bottoms and shoes have polished parts of the work’s surface to a shiny smoothness. 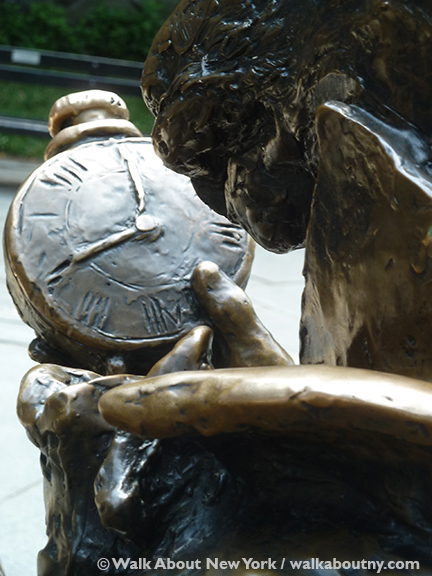 Because of the continued popularity of the Alice in Wonderland bronze with children, Central Park spends more than $10,000 every year to maintain it. The Mad Hatter’s features are those of the donor, George Delacorte. Alice & Co. have welcomed many children over the years. The New York Times, among other organizations, took exception with Mr. Delacorte’s brand of philanthropy. Although well intended, they believed it was not the best use of his money. According to his critics it could have been put to better use for hospitals, drug rehabilitation centers or education programs. The fountains and statues that he donated had no practical purpose. A salamander crawls around the base. Is this the hookah-smoking Caterpillar? Mr. Delacorte dismissed the objections, responding with the following, “What good is the Eiffel Tower? Not everything has to have a practical function. What do we remember about Rome? We remember the fountains and the statues. There has to be a place in life for the eye’s pleasure.” Because he was born and raised in New York, and made his success here, Mr. Delacorte wanted to use his money to give something back to the city. From all angles, Alice & Co. look good. When the Alice sculpture is swarming with children, no one would agree with the 1960s critics calling for something practical. “It just seemed a nice thing to have in the park. On Sunday mornings I watch the kids climbing over it, under it. It’s a regular parade,” Mr. Delacorte observed. Although the children never noticed the kindly donor, he saw the great joy his gift brought to so many. It is rare when children are not climbing, crawling and exploring the Alice bronze. Marvel at Alice & Co., as well as other sights, during our Central Park Walking Tour. The Tour is good fun and greater value.